As with most ATMs, customers are charged a fee to get cash. Businesses that partner with Maureen’s Hope through the ATMs for Good program, allow part of that fee to be directly deposited into Maureen’s Hope Foundation’s bank account. It’s that simple. To date, we are grateful for the support of the B’ville Diner and Nick’s Diner who are hosting ATMs for Good terminals. 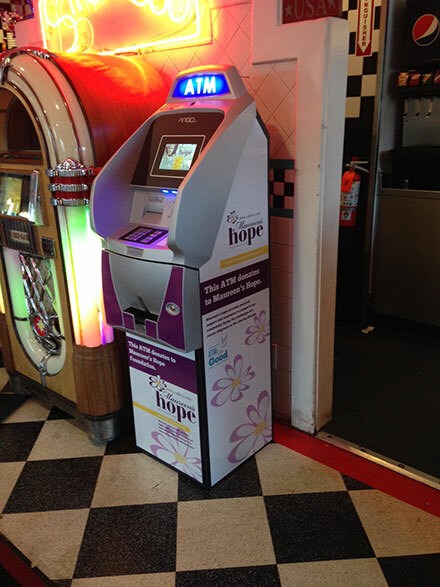 If you are interested in placement of an ATMs for Good terminal to benefit Maureen’s Hope Foundation, contact Susan Bertrand, President and Founder, at maureenshope@yahoo.com. For more information about the ATMs for Good program, read this story published by Eagle Newspapers on June 29, 2015.